Most apps don't bring me joy. Slack does. It's so much more than just a messaging app. The attention to detail, the playful vibe, and the robust feature set all amount to an unparalleled user experience. Design used to be an afterthought when it came to workplace software – companies would rely on aggressive sales strategies to compensate for weak products – but the marketplace has become so crowded that consumers can demand quality design. RelateIQ (on the right) was acquired by Salesforce (on the left) in 2014, because it was a threat. Notice how much better RelateIQ looks? It takes more than hip fonts and contrasting colors to get acquired, but they help. In 2016, Design has become so critical to a product's success that Slack enlisted MetaLab to spearhead its design. When software like Slack comes along, it's important for designers to figure out what makes it so great. Here are a few lessons I've learned from Slack. "Hey we should try Slack," an engineer said, early one morning, over a bowl of cereal, "It's trending on Hacker News." I Googled it and downloaded the native app. A group of us toyed around with its features. We had been encouraged to adopt new software platforms in the past. None of them ever stuck. Slack was so much fun, we all switched over from HipChat to Slack by lunch. Design principles aside, the main reason we switched from HipChat to Slack is Slack didn't crash 5 times a day. That's worth noting because every clever design choice would be useless, if not annoying if Slack couldn't get the core functionality right. Slack is defined by its emphasis on visual design. The app offers multiple themes for users to choose from, a luxury most consumer platforms don't even provide. Slack's bold use of color sets the tone for the user experience. HipChat uses a dull blue and gray color scheme, whereas Slack is bursting with color. 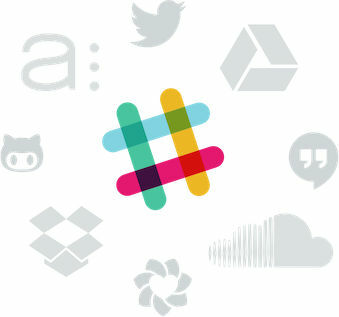 The vibrant plaid pattern invokes a hipster sensibility while riffing on Slack's multicolored, hashtag icon. The app handles linked content well. If an article is posted to a Slack channel (channels are like chat rooms), users can see the thumbnail next to the headline. Embedded video and media players (YouTube, SoundCloud and Spotify to name a few) play in the native desktop client as well. Less than six months ago I had never heard of Giphy, now I use it every day. For those of you who don't know, this integration allows users to type ‘/giphy unicorn‘ and an animated GIF associated with the user's term will appear, embedded in the chat window. This kind of fun is characteristic of Slack. It livens up your day. Slack even has a creative solution for reactions. Users can react to every line of text with an emoji. (Facebook has rolled out a similar set of emoji-based reactions in response.) If emojis aren't enough, users can upload their own images to Slack and use them as reactions too. While emojis can be annoying, they make it easy to respond when you are focused on something else. All of these visual details make Slack feel more like a fun social networking platform than a tedious workplace application. This section has nothing to do with resizing browser windows, Slack's interaction design is responsive. Whenever users click buttons, hover over avatars, or edit lines of text, Slack has an appropriate response. The app makes you feel important by reacting to everything you do. Nothing about uploading files should be fun, yet Slack somehow makes it enjoyable. When the user drags a file from the desktop onto the Slack window, a huge overlay appears. The over-the-top graphic design communicates the significance of the action. It makes the user stop and go, "Oh, I'm about to upload a file and it will be accessible forever." When the user edits a message they've already entered, a little editor appears inline. Again, mirroring the size of the action the user is performing. When the edit is made, the text flashes yellow and the word "edit" appears in light gray. If the user clicks away before finalizing the edit, Slack confirms that the change will not be saved. This attention to detail amounts to a nuanced user experience that's essential for a workplace. If you're messaging the CEO, you want to make sure you uploaded the correct file and the text you sent is editable. There are a handful of higher-level design choices that make Slack feel contemporary. These choices go beyond consumer-friendly design and reflect larger cultural trends in a compelling way. In 2007, Twitter users added hashtags to their Tweets, so they would be easier to group and search. There was an internal debate at Twitter as to whether hashtags would come off as too technical if they were productized. Fast-forward to 2016 and the hashtag is Slack's logo. Sure Jimmy Fallon and Justin Timberlake joked about the widespread use of the hashtag in a famous sketch on the Tonight Show since then, but that sort of cultural awareness impacts the user's relationship to Slack. At symbols allow users to tag coworkers in chat channels. Hashtags are reserved for the channels themselves. Even the name Slack is clever marketing. No one wants to be caught slacking off at work in the traditional sense. 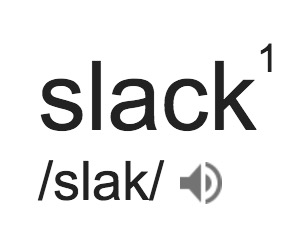 To slack means to "slack off," but the word is taking on new meaning. It's brilliant because the software is so fun that you almost feel like you're slacking off at work. It's tongue-in-cheek. The phonetics of the single-syllable name works well too. The verb "slack" is thrown around our office nonstop. "Can you Slack me that file?" "Oh, just Slack it to me." It took awhile for the verb "tweet" to take hold for Twitter and it's not as good for marketing because it's not the actual name of the app. It still sounds dumb when someone says "Facebook me," but the hard "-CK" sound at the end of Slack lends itself well to constant use. 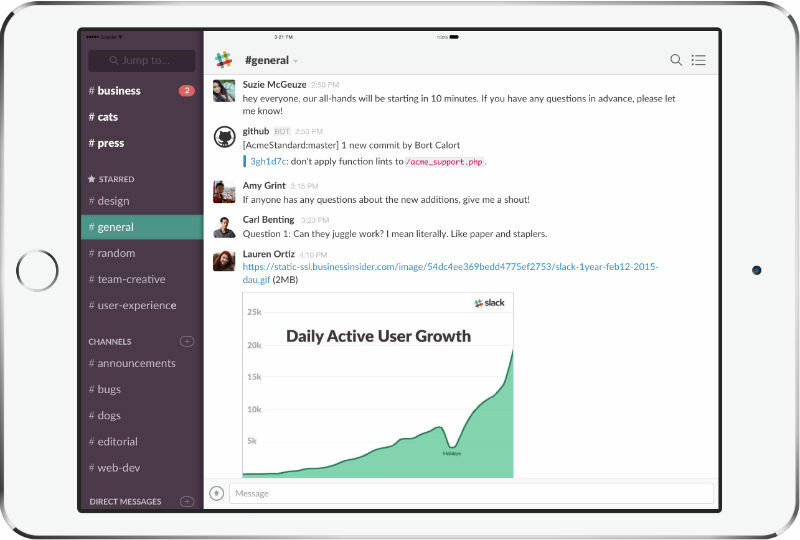 Slack is available on the web, on desktop computers and on mobile. Slack's mobile app is as robust as its native app. You can upload files, use emojis to react, watch embedded videos, and do anything else you would do at your desk. It's always fun to see who added which emoji reaction, so I was disappointed when I wasn't able to do that on mobile. I complained to all my designer friends. Two weeks later, it was in the product. It's not like they could hear me or anything – their designers are just that good! If you send a file to somebody over Slack, it's there forever. Sure there are permissions on who can access it, but every file you ever send is searchable. My largest criticism of Slack is its search. It just doesn't behave the way you expect it to. Having designed a universal search system, I'm aware of how difficult it is to do search well. I still view it as Slack's weakest feature. Slack integrates with other services. At our office, we have channels that stream data from GitHub, Travis CI, Help Scout and more. This means there is a centralized record of every piece of code that is pushed, every test that is run, and every support ticket that is submitted. While I use Slack in an office setting, there are Slack channels that are accessible outside of the office. Serving as a kind of real-time message board, open Slack channels are available for users to meet and collaborate. This isn't a sponsored post. I don't have any direct relationship to Slack other than being a user. I'm just a designer that is humbled and inspired by a product team that is doing everything (with the exception of search) right. While these design choices are easy to steal, there is a larger product philosophy to absorb. Slack knows its audience and knows the proper tone to strike. The UX is fun and exciting because talking to people has the potential to be fun and exciting. Sure it can be serious too, but that would be a weaker choice. Just ask HipChat. Most of my time is spent designing financial services software, so I can't include a sassy robot named Slackbot (worthy of a whole post of its own) to make sarcastic remarks, but everybody should learn from Slack and incorporate a dash of playfulness into their products.